Yocto will be built on a host machine targeting and igep board. It will use Poky software to generate the custom linux distribution Linux distribution. Before starting with yocto, you need to set up the host machine. Yocto is expecting the host system to have preinstalled packages. Depending on the type of development, the host system will need more or less packages. On Ubuntu / Debian here is a table depending on the type of development. In order to create a custom linux distribution; we will download the yocto project. Download meta-openembedded layer and switch to pyro branch. Download meta-qt5 layer and switch to pyro branch. Download meta-isee layer and switch to pyro branch. You should be now inside poky/build folder. Add all the layers into build/conf/bblayers.conf. from poky/build folder Create your own custom Linux distribution with the following command. The following table provides you the information about the commercial names of igep product and the MACHINE= machine-name you need to select when creating the Linux distribution using Yocto. The following table provides you the information about the different igep distributions. It is provided the DISTRO=distro-name and the description of it. Produces a minimal rootfs (sysV suite, withuot X11), u-boot, Kernel image and DTB for ISEE AM335x products. Meta-isee is the layer that provides you the support to build your own custom poky linux distribution. In fact it provides you a set of predefined images that will build some components, like focusing on building the minimal set of components required to boot an igep board or building more complicated distributions with X support or even build an image with a Sato or LXDE Desktop. The following table explains the types of images, the description and the approximated size to give you a hint of what you are building. When you are bitbaking an image with X support you MUST set DISTRO=distro-name compatible with X environment. igep-mrskeltal-image Only the bare minimum required for a board to boot. This means you will only find poky minimal set of rootfs and kernel modules. igep-minimal-image The minimum required for a board to boot plus set of configured tools and utilities aplications to provide user easy access to board capabilities. igep-basic-image Based on igep-minimal-image plus Qt5 framework (demos included), Gstreamer1.0, and Pulseaudio. igep-basicX-image Based on igep-minimal-image plus X environment. igep-full-image Based on igep-basic-image and igep-basicX-image. Provides Qt5 framework (demos included), Gstreamer1.0, Pulseaudio, and X environment. igep-sato-image Based on igep-full-image plus a Sato Desktop. Not all images are compatibles with all the igep machine product. Here is the compatibility chart to guide you what you can/can't build depending on your igep board. In order for developers to use Yocto Project SDK, Yocto Project must be set up, all needed meta-layers downloaded and configured in bblayers.conf. Also target image should be built correctly. Cross-Development Toolchain: This toolchain contains a compiler, debugger, and various miscellaneous tools. Libraries, Headers, and Symbols: The libraries, headers, and symbols are specific to the image (i.e. they match the image). Environment Setup Script: This *.sh file, once run, sets up the cross-development environment by defining variables and preparing for SDK use. The SDK is installed on any machine and can be used to develop applications, images, and kernels. An SDK can even be used by a QA Engineer or Release Engineer. The fundamental concept is that the machine that has the SDK installed does not have to be associated with the machine that has the Yocto Project installed. 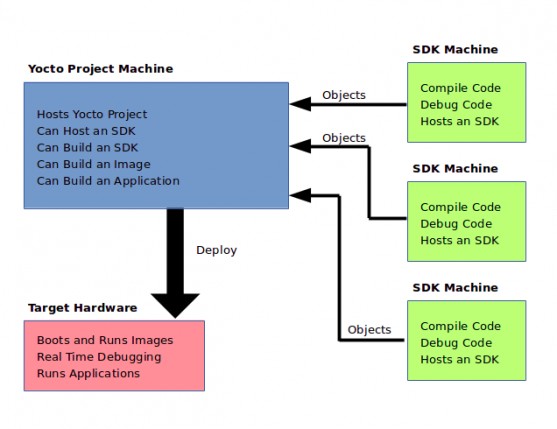 A developer can independently compile and test an object on their machine and then, when the object is ready for integration into an image, they can simply make it available to the machine that has the Yocto Project. Once the object is available, the image can be rebuilt using the Yocto Project to produce the modified image. Normally Target systems specifications are quite restricted, specifically in embedded target systems. It is convenient for the developer, in order to save time, to develop, compile and test their applications on their host platform which is usually a powerful machine. This is the basic of the cross compiling process. Later an emulator is used to test the application. Developers can build ISEE Yocto Project SDK in order to use it at their convenience. First of all a SDK installed will be produced and then developers will user the SDK installer in their Host machines to install all ISEE Yocto Project SDK components. To produce the SDK installer run this command after sourcing Yocto environment (source oe-init-build-env). After the environment is set up developers can already compile and debug aplications. It can also be used qemu emulator available in folder to emulate target applications.